Crisis Management Training By Real Response Experts - Book Now! Today’s leaders face demands unlike any before. Within emergency management, business continuity and crisis communications there can never be a one size fits all approach. Plans have to be about the customer, about the person and about the outcome. In order to have a strong Business Continuity Management program, each element of the star must be in place. Many of our clients have these concepts in place under different names and guises – but the intention and outcomes are the same. We deliver services on all four points of the star from setting up governance processes and policies, developing an understanding of the business critical processes, systems and dependencies through to the rollout of plans, training and testing. Crisis management training empowers individuals and organisations with effective strategies to respond in crisis or emergency situations. Timely and deliberate decision making is paramount in situations involving the health and safety of people under your care, and Crisis Management Training with Real Response provides real solutions for overcoming obstacles and maintaining business continuity. We use realistic simulations that help you develop appropriate crisis management strategies that are tailored to your specific business or industry requirements. What is crisis management training? Success in the modern business environment entails a lot more than turning a profit. The business plan remains important, although a robust and growing business or enterprise needs to also focus on external influences that can derail any plan, such as cyber-attacks, physical attacks and many other potential threats. Owners and employees should be prepared for any eventuality, and training exercises delivered by highly experienced professionals at Real Response will help you make the right choices under pressure. Crisis Management: Strategic Focus on the management, coordination and response to incidents and crises. 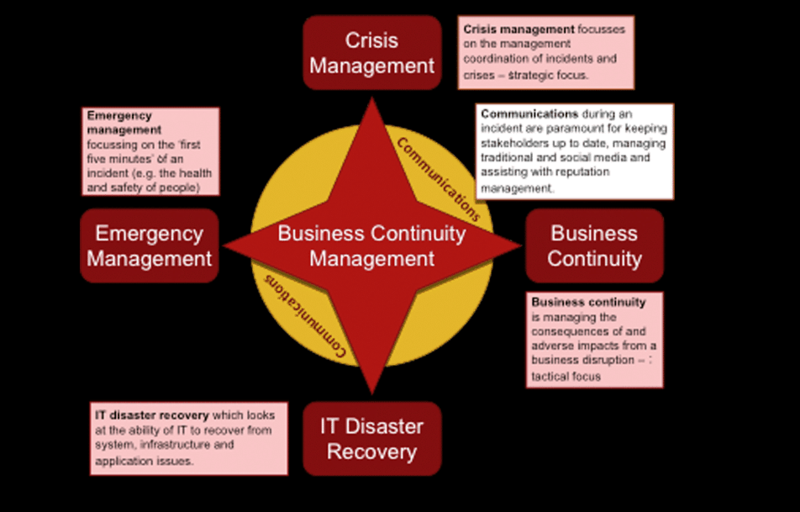 Business continuity: Tactical focus on management of consequences and adverse impacts caused by a disruption to your business. IT Disaster Recovery: Assists with the ability of IT to recover from system, infrastructure and application issues. Emergency Management: Focus on the first five minutes of an incident affecting the health and safety of people, along with workplace and business functions affected by an emergency. Training with Real Response will help mitigate the incidence of personal injury, reputational damage, financial implications and other liabilities that can negatively affect an organisation or its stakeholders. We believe in developing a high degree of leadership competency, organisational capability and the skills required for effective emergency response that delivers optimum outcomes. What is involved in crisis management? Crisis Management training with Real Response delivers the skills and knowledge required to coordinate and apply a crisis management plan according to your individual requirements. Who should undertake crisis management training? This training course is for natural leaders who are committed to optimising health, safety and smooth business operations for everyone under their jurisdiction. This can apply to individuals and groups with demonstrated managerial skills or public relations expertise, along with those who have primary responsibility for preparing and instigating communications and appropriate response during an emergency or crisis. Tailored training takes several forms and can be adapted to your exacting needs. Real Response will train you and your team in the methods and procedures required to keep your crisis management plan up to date. As your organisation or business expands and evolves, it’s important to remain abreast of the latest developments for implementing the best occupational health and safety procedures, along with methods of averting potential crises. Crisis management training courses are ideal for managers, senior personnel and human resources staff who show natural crisis management capability. However, Real Response trainers are much more than desk-bound workers, and include some of Australia’ finest paramedics, firefighters, military emergency and medical emergency personnel with a dedication to make a real difference. Real Response brings crisis management and first aid courses alive through the use of high quality, high fidelity simulations that engender real responses. We are specialists in tailored simulation-training packages, and are the only company to do so outside of the professional medical and military fields. How does Real Response undertake crisis management training? The objective of Real Response simulation-based training is to ensure your organisational crisis management plan functions optimally during a genuine crisis. By utilising real-time scenarios we can help you test your plan, introduce new ideas and rehearse existing strategies in realistic situations. We will investigate the strengths, weaknesses and vulnerabilities in your present crisis management strategies. Our trainers understand all possible eventualities, enabling us to ensure you are up to date and compliant with operational and legal guidelines. Simulation training is the best way to assess the efficacy of your crisis management structure and staff performance during realistic crisis and emergency response. We get staff up from the desk and into real life action, ensuring they are crisis-ready the moment training is complete. Crisis simulation-based training is helpful in a number of ways. Real Response orientates thoroughly with your organisational structure and communications to evaluate potential risks. We identify areas that require testing and strengthening, while developing tailored scenarios for deeper crisis management analysis. We encourage all course participants to develop their maximum crisis management performance and business continuity capabilities. How is crisis management training tailored? Real Response coordinates the entire crisis management training program in consultation with the client. We collaborate with you in defining exercise objectives, planning the process, and encouraging participation from employers, staff and stakeholders. We will help you formulate a schedule of events, required documentation and learning tools relevant to your organisation. We then customise simulations that can include audio, video, images, email, 000 calls and other notifications. We introduce actors, props and realistic scenarios into the equation for deeper learning and greater knowledge retention. Real Response course instructors and trainers create simulated reality that engenders real crisis management response, and we are famous for our optimised first aid and emergency response training for establishing a safe working environment. We focus on the specific objectives of your tailored training program to deliver best possible outcomes. Real Response crisis management training provides ongoing evaluation and data collection including collation and analysis of training outcomes and areas requiring improvement. Our comprehensive training includes foundational first aid courses such as Provide CPR, Provide First Aid and Provide Advanced Resuscitation. Crisis response isn’t single-dimensional, so Real Response makes certain you have every angle covered in your management strategy. It’s no secret that modern society presents new challenges for health and safety, and we make sure you are ready to respond in a timely and effective manner no matter what obstacles stand in your way. At Real Response, we deliver capabilities that last. We are future-focussed and ensure your team are aware of risks and hazards, while also having contingency plans in place to deal with unexpected accidents, emergencies and crises. Optimum course outcomes are achieved in several ways. Diagnosis: We will analyse and evaluate your present crisis management structure and compile a tailored report regarding risk profiling and assessment, along with recommendations. Crisis management planning: We will help you renovate an existing plan or build an entirely new one according to the initial diagnosis. Our bespoke planning is tailored specifically for the needs of your business or organisation. Training: Real Response simulations experts orientate your team with the crisis management plan using active exercises and workshops. We build relevant skills, deliver industry-specific knowledge, encourage teamwork and empower staff with leadership capabilities. Testing: Timed crisis management and emergency response using realistic scenarios engenders genuine capabilities. We highlight risks unique to your environment and encourage every course participant to develop their full potential. Adaptation: It’s important that training outcomes are applicable to the needs of your business. Real Response will evaluate outcomes and provide a report with recommendations for overcoming weaknesses or vulnerabilities in your crisis management structure. We structure crisis management plans with potential for adaptation that will future-proof your business. Our highly qualified and experienced instructors are world-class legends in their chosen fields. Real Response was founded in a unique partnership between some of Australia’s best paramedics and educators, with a plan to impart life-saving skills and knowledge that can be fully recalled for response to low-frequency, high-risk emergency situations. Real Response course instructors know how to think on their feet and will teach you and your team how to do the same. Our trainers want you to be involved, ask questions and have a go. Great effort and planning is taken to ensure an inclusive, safe and non-intimidating learning environment. We don’t want you to simply memorise a stack of information, we want you to experience it yourself in a ‘learning by doing’ environment. Crisis management training courses are serious business, but we make learning an enjoyable and enlightening experience for everyone involved. Real Response training is a great opportunity for team building and bonding between management and staff. Emergency response and crisis management is often a team effort requiring participation and cooperation on the fly, so we make sure your team are all on the same page and ready to act with confidence and capability in any situation. Whether your business or enterprise is large or small, there is a lot at stake, making situational awareness and crisis management training high priorities. If you need to undertake emergency drills for the ‘first five minutes’ of response, improve media outcomes, reconnect IT services in a hurry, or establish a long-term crisis management contingency plan for your business, Real Response will tailor solutions just for you.